Slim aluminum alloy housing body with pen shape design, easy to grip and portable. Equipped with magnetic board, holding the screws taken off from the repairing items, no more screws lost. Making repairing work much easier and more convenient. Both automatic and manual operation are allowed, ensure high working efficiency. 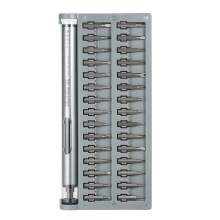 50 pcs drill bits and 4 extend rod contained, meet most needs. Maximum torque up to 0.35N.m torque ensure high working efficiency. Driving speed up to 150RPM load-free, enough for electronics devices repairing. A quick-change chuck makes it easier to change bits on this power screwdriver. LED lighting function, convenient to use in the dark place. Slim aluminum alloy housing body with pen shape design, easy to grip and feels comfortable. Equipped with magnetic board, holding the screws taken off from the repairing items, no more screws lost. Lightweight and compact with portable case, you easy to carry and use anywhere needed.